[Free Books] Time for a Kiss, Master｜MANGA.CLUB｜Read Free Official Manga Online! Io starts working as a lord’s valet in the guise of his older twin brother Ces. Lord Kazar has closed off his heart completely in the wake of his friend’s betrayal. Undeterred by Kazar’s cold demeanor， Io works hard to serve his master， who gradually begins to crack smiles. However， as he and Kazar grow closer， Io starts having misgivings about deceiving his master about his identity...... As well as the popular digital series， this manga includes a story that has never been published before. 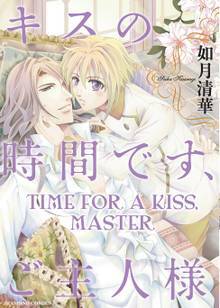 In total， there are siz stories: ”Time for a Kiss， Master”， ”Tell Me， Master”， ”Don’t Let Me Go， Master”， ”Time to Wake Up， My Princess”， ”Love Talk”， and ”Stay by My Side”. I watched CDawgVA read this and I liked it so I thought I would read it for myself so I could see it uncensored.